What to talk about as a Beginner in French? What to Talk About as a Beginner? Here’s a paradox of language learning. You spend hours learning how to speak a foreign language so that you can use it. YET as a beginner, you believe you don’t have the tools necessary to converse with others! This is false, and if you keep reading you’ll find out why. How can I talk to French people when my French is so bad. What do I say? I don’t do this often, but I’m giving you the biggest piece of advice first. BE CURIOUS. Wait… what? John, how does that help me talk to French people? People love talking about themselves and it’s an easy way to break the ice (not to mention everybody loves a good listener). As a beginner you should try as hard as possible to converse about the French person! Naturally, by you being curious in them then they’ll start asking you questions about where you’re from, etc.. and a conversation will flourish. But keep in mind, you have to be genuinely curious! You won’t have a great conversation with somebody if you are halfheartedly engaged. By using this, you can carry on a huge conversation and the added bonus is they do all the talking!! More on that later. Here are some important words to be a curious Frenchie: who (qui), what (quoi), where (où), when (quand), why (pourquoi), and how (comment)! In addition, you should know how to ask people about things they like and opinions. Where is the best place to buy _______? Why do French people like _______? When is the best time to _________? These are simple questions, you can start asking somebody about something and lead the conversation into another direction. Chances are if you’re learning French, you’re not French. If you talk to a French person, they’ll notice you’re a foreigner, but this isn’t a bad thing at all! Use your native language or country as a talking point. Also, don’t forget to BE CURIOUS! Bonjour! Are you from around here? I’m American.. I was wondering where I can find a good café? Why do you like that/those café(s)? What do you think I should order to get a true French experience? Are the people there nice? Do you know of any other things I can do here (in this town/city)? Do you know any other things I should see here/in France? Now, what you don’t see in the slew of questions I provided is the answers of the French person and your additional comments. For example, once you mention your nationality, they may be curious about where you’re from and why you’re in France. Tell them why and mention that you love speaking French / love the country / love _____ and keep the conversation flowing. If the person tells you some possible adventures you can seek out, thank them. The added benefit of being curious is that it can enhance your trip. As a beginner, your grammar, vocabulary, and maybe even syntax is limited to some extent. By having the French person do most of the talking while you facilitate the dialogue, you can hold a huge conversation with little effort. Listening (not speaking) then becomes your biggest problem, however the French person would realize you’re a beginner and possibly adjust their speech for you. Also, try not to simply bombard them with questions, but incorporate small comments (and head nodding) to show you understand as well as you’re still interested. 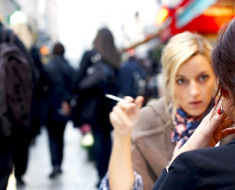 As you get better (more confident) at French, you can increase the amount of dialogue you put into the conversation. Initial Question: What’s your favorite football team/club/league? Follow Up Questions: Why do you like them? Who’s your favorite player? Have you ever been to _____ (region of the team if it’s really far)? Do you watch them often? Are they playing well now? Follow Up Questions: Almost anything related to _____. Where’d you get it? Was it expensive? I love dogs, what type of dog is it? Where can I get my hair done like that? etc…. What I want you to take away from these initial / follow-up questions is that there are many directions a conversation can take you. Try thinking of some conversation starters! By asking good, simple questions, you move the dialogue. Can you also see how a simple question opens up some discussion. If you know greetings, things about the weather, how to say you like things/dislike things. You have a huge arsenal of tools to get a conversation going. Always greet somebody! Talk about the weather if you have to (at least you’ll get practice there). Ask how to get to places. Ask what they like. So in essence, play up the fact that you’re not French, be curious about other people, and let them do all the talking. If they try to switch to English then use this article: How to Make French People Keep Speaking French. I hope these tips help, any comments can be left below, I’d love to hear what you think. I love your website -in particular this section on “being curious.” Very clever and so true! This is some of the best advice I’ve seen and I will certainly pass it along. I appreciate this article very much. I have been studying French for two years and now from reading this, I feel confident enough to speak with native French speakers.